Your intranet needs to deliver your values and brand to each of your users, while engaging them with exciting content and applications they feel part of. From the initial design and architecture, to updates made to logos or styles, you need to be in control of how your digital workplace appears and able to reflect any organisational changes quickly and without any further expense. Our brand management features ensure you are in control, with help and support from our onboarding and support team, and can make any necessary adjustments with ease. Without fuss or design skills, you’re free to update much of the design of your intranet yourself, including logos, toolbars and font sizes. Keeping updates in-house avoids lengthy and costly processes everytime you want to make an update. With easy to use tools to make updates your intranet can be kept fresh and up-to-date, to avoid user drop-off. The overall ‘look and feel’ of your intranet can be as important as the content it contains in ensuring employee engagement. Invotra offers templates, page layouts, widgets and design aids needed to lay-out an intuitive intranet that’s easy to use. We can help you consider the initial big things, like navigation menus and structure and design your information architecture and then our design feaures empower you to make immediate and ongoing design changes to reflect the organisation over the months and years. Simple logo changes or amendments to branding become easy to update, rather part of an expensive, lengthy process. Updates can be made to branding in many areas, including your logo, fonts, colours, layouts and your menus and headers and footers. 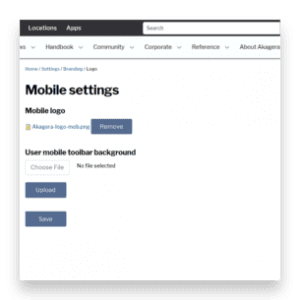 In addition the widgets used to pull in and display content across the site can be customised using various styles, helping to fit content seamlessly into page layouts. Added to the ability to customise content types and to designate the role of content layout manager, Invotra’s brand management features put you in control of how your intranet is designed. Brand buttons – Stay in control of your brand management with our branding button feature which provides the ability to lock down functionality on all content and branding. Widget branding – Our widgets control the content in the site and give you the ability to customise your display and allow you to personalise content which makes your user experience more relevant, therefore, enhancing engagement. Content types – Our Intranet offers multiple content types to meet your organisation’s publication needs. Our content types include news, general information pages, manuals, forms and policies plus the ability to create custom content types. Page layouts – Retain your organisational identity by using our completely customisable page layouts and achieve the right look and feel for your intranet. 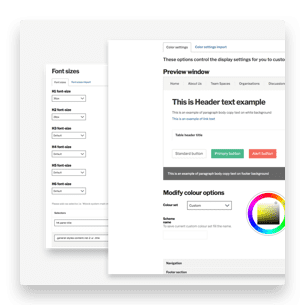 Brand colours – Make simple updates to change the colour of your navigation, footer section, body section, table colours, link colours, standard buttons, primary buttons, alert buttons, vertical tabs, toolbar and mobiles. Logo control – Logo changes are simple as your webmaster has the ability to change the logo on the site, removing lengthy and expensive control processes.